This is a sponsored post written by me on behalf of Gladiator GarageWorks. All opinions are 100% mine. 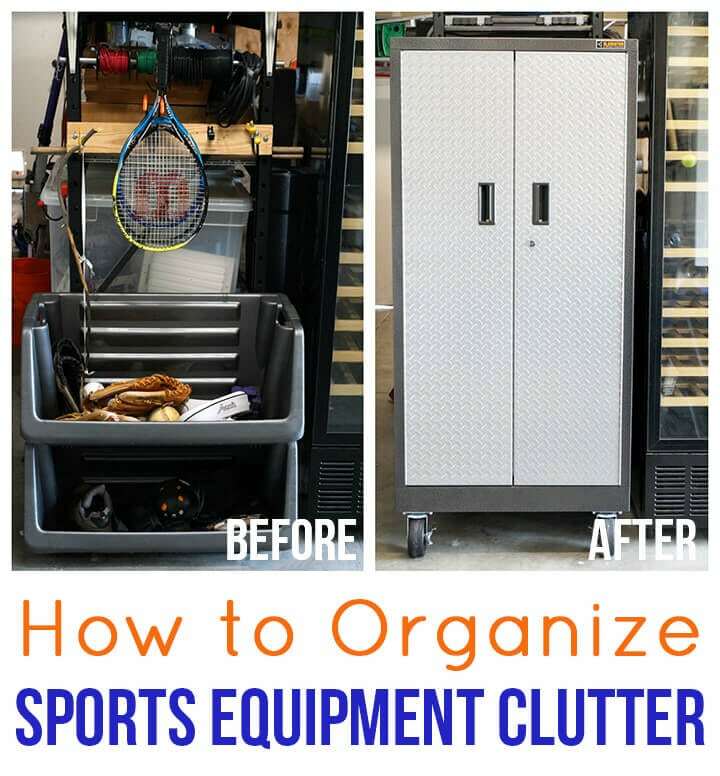 I love this quick and easy solution for how to tame and organize sports equipment clutter in your garage! 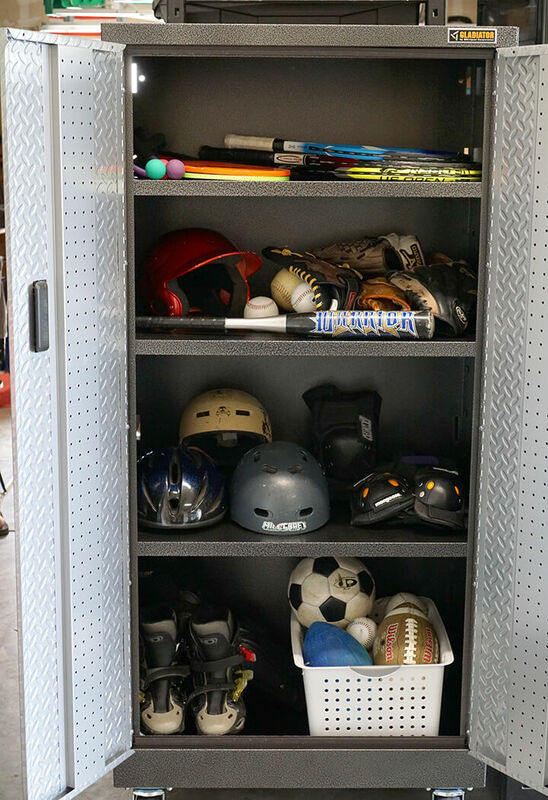 It’s time for spring cleaning, and this past weekend we tackled all of our three boys’ sports equipment that was cluttering every corner of our garage. Every time I turned around, I found myself tripping over a baseball helmet, a bat, or someone’s pair of rollerblades! 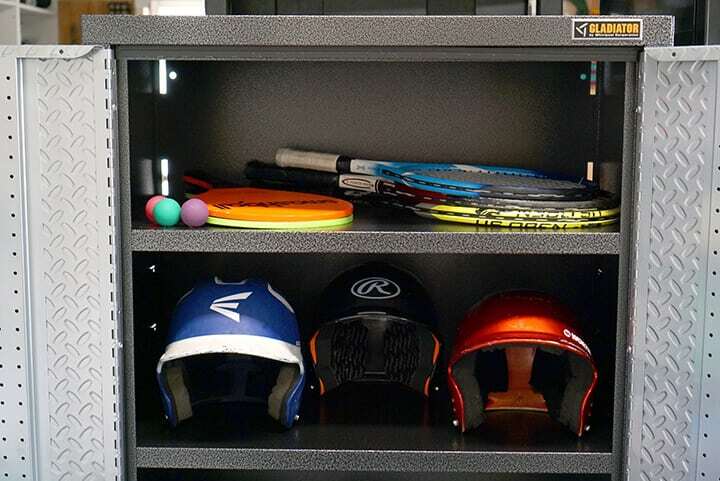 I was totally fed up with the sports clutter, so we came up with a simple but highly effective storage solution to keep all of our sporting gear organized and in one place! We had previously tried to corral the sports equipment with large open bins and oversized hooks for the boys’ bats and tennis racquets. It seemed like a good idea (in theory!) 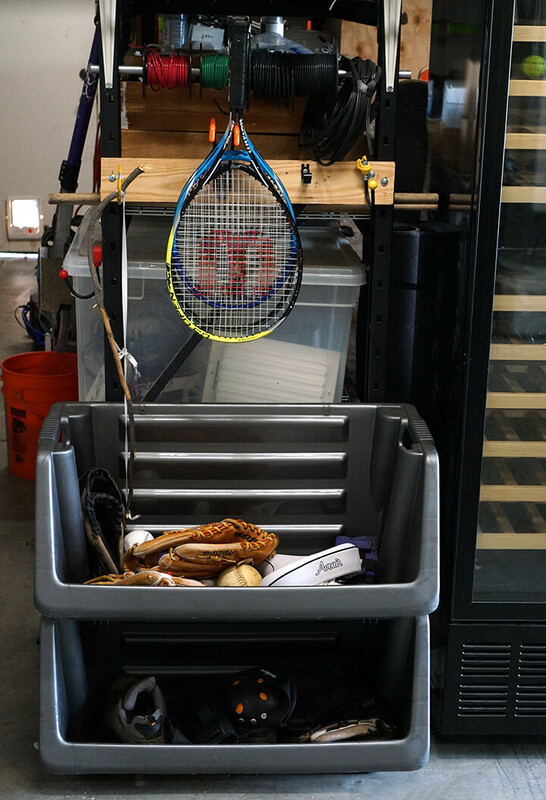 since it was easy for the boys to quickly toss their gear into the bins; however, in actuality, most of the sports equipment never even made it back into the bins. It was ALL over the garage, and we needed to find a better way to quickly and easily keep everything in its place! 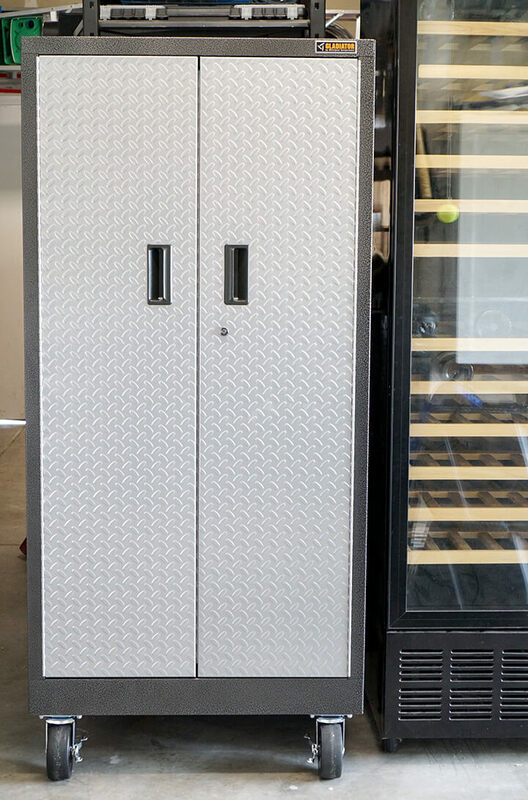 The highly rated Premier Series Tall GearBox from Gladiator GarageWorks was exactly what we needed to help tame and organize our sporting equipment disaster! This heavy duty cabinet holds up to 300 lbs (50 lbs per shelf) and comes with one fixed and two adjustable shelves for flexibility in storage. I loved that I was able to customize the shelves to be exactly the height I needed! I thought that I was going to have to ask the boys to get rid of a bunch of their lesser used gear (this is spring cleaning, after all! ), but it turns out that there was plenty of room in the highly rated Premier Series Tall GearBox for all of their favorites! Our spring cleaning session ended up being more of a “Spring Keeping” session! The 18″ deep shelves hold a TON of equipment! They’re even deep enough to store those pesky rollerblades that I was always tripping over – yay! Our garage looks a million times better now that our sports gear has a durable place to call home! 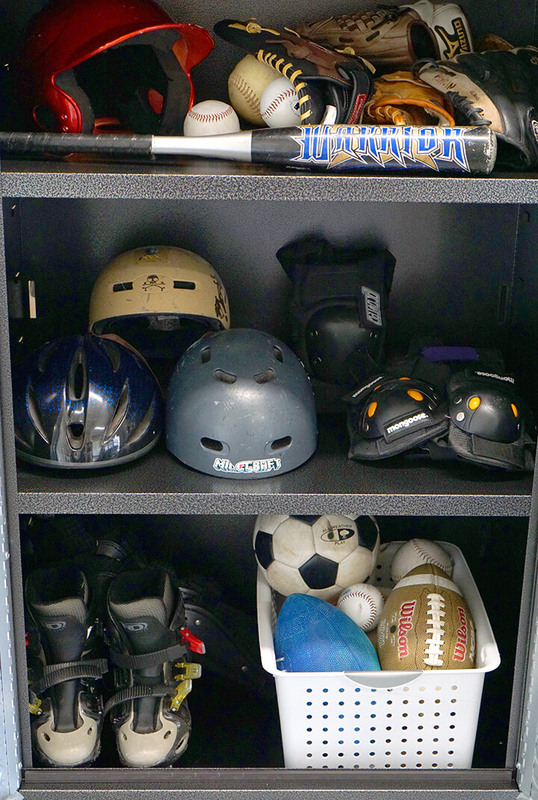 I’m also pretty sure that our nice sporting equipment is happy to have designated shelf space and some respect instead of being tossed in the corner in a heap! 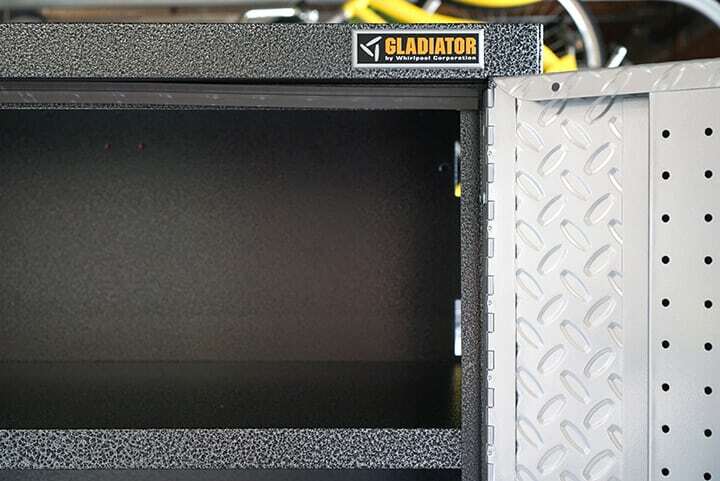 The Gladiator GarageWorks storage was the perfect solution for our needs, and it has been working like a charm to keep everything organized and in its place. Where would you use a GearBox in your home? Head over to Gladiator GarageWorks Facebook and website to check out products that can help you achieve your “Spring Keeping”! Get $100 off + free shipping on orders of $599 or more* at Gladiator GarageWorks from 4/25/16-5/11/16 using code KEEP100. * Offer available on eligible products from 4/25/16 to 5/11/16. Limit one promotional code per purchase. Order value for dollar off threshold and free shipping excludes applicable taxes and installation fees. All Gladiator® Gar-ageWorks Terms of Sale apply during promotional period. Offer is only valid on eligible products purchased directly through www.GladiatorGarageWorks.com or by calling 866-342-4089. Shipping, handling, and installation fees are extra. 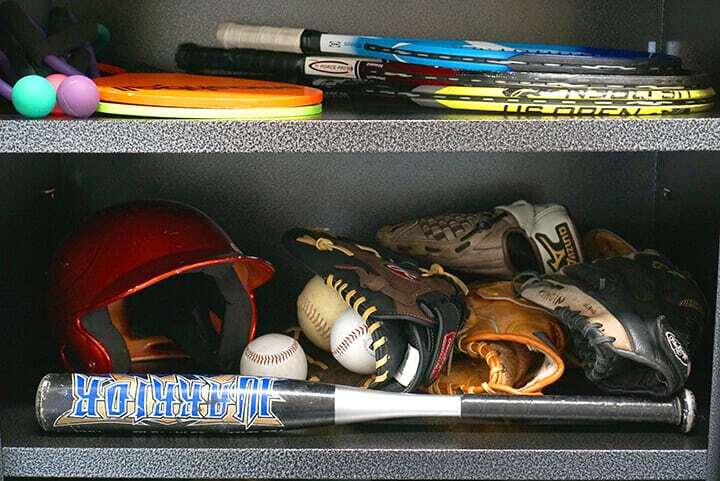 This looks like a great way to organize athletic clutter! While it’s great that your boys are so athletically driven, I can imagine that the mess was starting to drive you crazy. I’ll have to look in to one of these storage boxes, so thanks for sharing!